The three astronauts who have been researching the effects space has on the human body aboard the International Space Station returned safely to earth early Saturday morning after 186 days in space. 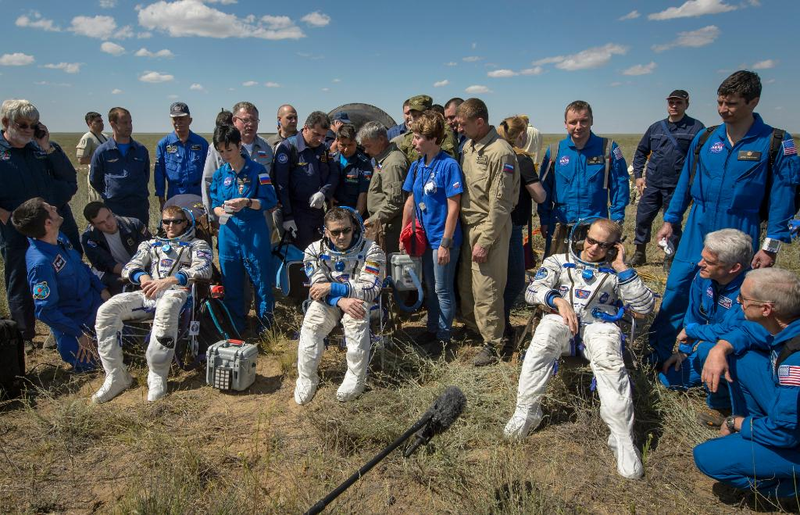 The three men, including Commander Tim Kopra of NASA, flight engineer Tim Peake of the European Space Agency, and Soyuz Commander Yuri Malenchenko of the Russian space agency Roscomos, landed safely near Dzhezkazgan, Kazakhstan at 5:15 a.m. EDT. The astronauts were part of Expedition 47, which was tasked with researching the effects of microgravity on the musculoskeletal system, along with testing how robotics can make exercise equipment smaller for longer trips. “From the potential development of vaccines, to data that could be relevant in the treatment of patients suffering from ocular diseases, such as glaucoma, the research will help NASA prepare for human long-duration exploration while also benefiting people on Earth,” the organization wrote in a press release. Currently there are still three people on the ISS. NASA astronaut Jeff Williams, along with Oleg Skripochka, and Alexey Ovchinin of Roscosmos, will be there for three weeks until the arrival of new members.